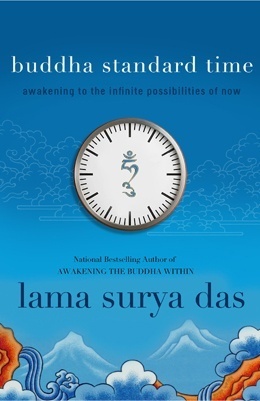 Surya Das walks us through how to live completely in the now, in “Buddha Standard Time.” We have the power to manipulate time by altering how aware and mindful we are of the present moment. The practices outlined within are increasingly important in today’s hectic day and age. Really got a lot out of this book and its tips, techniques and recommendations on how to slow down, be present and mindful. It’s not time that we lack, but focus. But what if time did not control us? What if we felt that our time and our lives were our own? Determine a reminder for yourself to breathe and slow down – whenever you stand up, go to the bathroom, hear something, etc. Time Out – Let go of yourself. Ask – “Who and what am I, really, beneath it all? Who or what might continue on when my body turns to dust? Who or what am I right now? What time is it really?” Follow the silence that comes with these questions. If there is no beginning or end, can we say time exists? Being focused more about being open and sensitive to change – in self, others, environment, etc. People are natural harmonizers – we innately mirror other people’s moods, posture, body language, etc. This entry was posted in Books and tagged Brain, Buddhism, Meditation, Mindfulness, Spiritual, Surya Das on March 12, 2015 by Blas.